I know the show well, but not because I was there. I was on the other side of the country that night—not to mention being just 2 years old and change. A ticket stub (not mine) from June 19, 1976. I know it because I’ve listened to a recording of the show many times. Fans recorded it during its live broadcast on WOUR Utica and WNEW New York, and a soundboard recording is also in circulation. This performance and thousands of other concerts by a multitude of artists are part of my collection of live music, amassed in various formats over the past 20 years—and aided by a changing trading scene that has gone both digital and online. I love live music—there’s just something wonderful about hearing a band as they were on a particular date, warts and all, including the stage banter, flubs, and musical selection. Although I enjoy going to concerts (and have been to a large number of them), the boundaries of proximity and time allow for only so many, not to mention all the great music that was performed before I was even born. So in addition to collecting as many of the shows I've attended as possible, I also love listening to other slices of musical history. When I stumbled on live-music trading in the early 1990s, tracking down shows was challenging and trading was tedious. You’d set up snail-mail trades of equal numbers of cassette tapes, put them in padded envelopes, and bring them over to the post office to ship them along their merry way across the country (and in some cases, around the world). Cassettes slowly gave way to CDs and DATs. At one point, a move prompted me to give away the bulk of my hundreds of cassettes. I kept a few that I just couldn’t bear to part with, including my friend’s stealth recording of a Black Francis (aka Frank Black) show we saw together at McCabe’s Guitar Shop in Santa Monica on March 22, 1991. For lots of people, trades waned relatively quickly when downloads became feasible. It started with terribly inefficient means such as IRC channels and Hotline or FTP servers with a restricted number of logins. A BitTorrent download on etree.org. 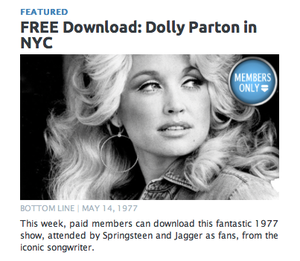 BitTorrent trackers such as bt.etree.org, Dime, and The Trader’s Den have become the go-to sites for free downloads of new and vintage recordings. The sites’ rules vary, but most of them generally respect the wishes of artists when it comes to what is and isn’t kosher: Commercially released tracks from any performance they host are a no-no on Dime, for example. And certain bands, such as the Allman Brothers Band, are cool with people trading CDs of their shows, but explicitly disallow posting them online for download. BTW, the ROIOs exist, you can’t make them vanish. So, why not let your fans get them for free from one another instead of having to purchase them from commercial bootleggers on auction sites? Many shows available for torrenting—especially on Dime and The Trader’s Den—are known as ROIOs, or Recordings of Indeterminate (or sometimes Independent) Origin. You know, bootlegs. But that term more specifically refers to an unauthorized recording. The idea behind sites such as these is that nobody is profiting from the work of others; people share recordings with a community of like-minded fans (and sometimes the truly fanatical) with the understanding that they are never to be bought or sold. The legality of these recordings is varied and complex. Many bands, including the Grateful Dead, are known as taping-friendly and happily encourage fans to swap recordings. Other performers explicitly prohibit the practice. Then there’s the large gray area in the middle, where bands tacitly allow taping and trading. And in the past few years, bands themselves have gotten in on the fun by releasing official live recordings (more on that shortly). The moe. landing page on the Live Music Archive. The Internet Archive’s Live Music Archive offers an amazing collection of direct downloads and streams of more than 4000 artists and bands. Bands have the final say on whether their recordings are archived there. Notable holdouts include Phish, a band that allows taping and trading of shows in many other ways and sells shows directly to fans. Thousands of great recordings—from audience (AUD) recordings to soundboard (SBD) patches to radio (FM) broadcasts—are in circulation. A relatively new entry in the field is official SBD recordings. Phish, for example, sells shows mere hours after playing the last note of the encore. It offers them in assorted formats—MP3, FLAC, FLAC HD (24-bit, 48Hkz), Apple Lossless, Apple Lossless HD—as well as on CD. Most Phish shows (depending on the tour and venue) come with an added treat: Ticket holders receive a free MP3 download of the show they attended, usually available by the time they get home. The Live Phish site is powered by Nugs.net, which helps lots of bands sell their live shows to fans. Its LiveDownloads site sells shows from Gov’t Mule, moe., the Black Crowes, Ratdog, Crowded House, Metallica, Pearl Jam, Red Hot Chili Peppers, and many others. 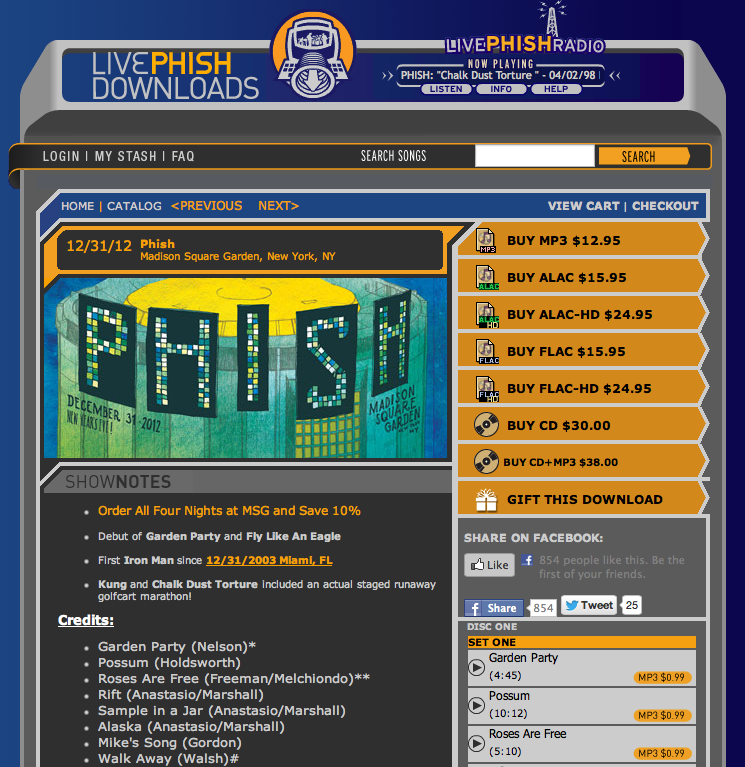 Bands such as Phish sell soundboard downloads in many formats soon after the show ends. 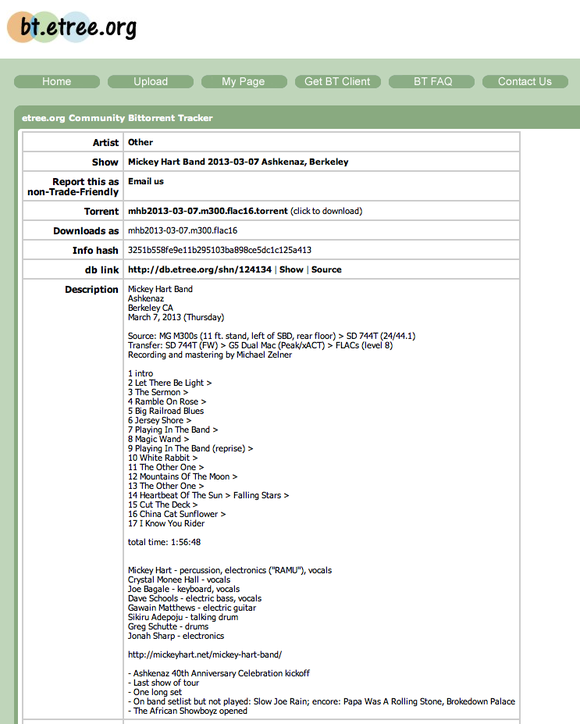 The Allman Brothers Band sells both SBD downloads and CDs of shows. Interestingly, even while they sell their shows, most of these bands still allow fans to set up giant mic stands and record every note to post freely for download. A free weekly download for Concert Vault members. Concert Vault offers streams and downloads of concerts—purchased from the archives of Bill Graham Presents—recorded between 1965 and 1999 by a staggering array of artists. Best of all, a membership ($4 a month or $40 a year) gets you two free weekly downloads chosen by the staff. Some recent gems include Santana and Janis Joplin shows at the Fillmore East (1971 and 1969, respectively), U2 in Boston in 1987, and Ray Charles at the Newport Jazz Festival in 1960. I used to burn every show to CD to enjoy on a stereo or in the car, but that became unwieldy. (I still have several boxes full of CD-Rs in jewel cases with printed labels and cover images I pulled from the Web.) Now, I burn backups of the lossless audio files to data DVDs, and I scan and catalog their contents with NeoFinder so that I can find them in the future. I have a lot of those, too—at last count I was north of disc 1250—but in paper sleeves and labeled with just numbers, they’re much more manageable. NeoFinder (previously CDFinder) lets me keep track of all my backup DVDs. Using a few different software audio players on my Macs, such as Cog and Enqueue, I can listen to the downloads at work. (Alas, not on iTunes, which doesn’t support any lossless format but Apple Lossless.) But I can also convert files to MP3s and put them on a flash drive that plugs into my car stereo. The transition from snail-mailed cassettes to high-speed BitTorrent downloads has changed the nature of trades. For one thing, the technology has made it much easier for anyone with a decent Internet connection and basic understanding of peer-to-peer file sharing to access a treasure trove of live music. As a result, I’ve now amassed over 6000 recordings. And with official downloads becoming more prevalent, the quality of the recordings is high. At the same time, it has made the whole process much less personal. As with ATMs replacing bank tellers, there’s less human interaction. I built up friendships with several tapers and traders over the years as a direct result of our one-to-one dealings. Now the level of dialogue rarely goes beyond posting comments on download pages (mostly thank yous, with the odd bit of snark). And with official downloads, the relationship has changed from being between fans and tapers to being between fans and bands—which, in many ways, makes a lot of sense since it’s their music in the first place. It’s still an exciting time to collect live music. Every week I'll find, say, a new lossless download of an early 1970s Pink Floyd show from a lower-generation tape with more complete tracks. And for a live-music geek like me, that’s music to my ears.